I am so excited to see all of you today. My goodness we have been in a whirlwind of celebration with two week ends for the 4th Celebration. It is really nice to slow down just a bit and enjoy the beautiful summer weather we are having I know that some of you have really had horrible heat and storms like we had last year. Come on back to the porch and sit under the fans with us we are all having some ice cold lemonade and it is so good, I just know that someone will bring a special treat to go with it. Thank you so much for coming today, your visit is always very special to me and I hope you come back soon! Hi Miz Helen, I hope you're keeping cool! It looks like another great menu of featured recipes. Thanks for hosting. Hello! Thank you for hosting. Hi Miz Helen, Thank you for hosting. I hope that you are enjoying the summer and keeping cool in Texas! Thanks for featuring my Italian Bubble Bread and thanks so much for hosting! Miz Helen, I have shared a Vegetable Tian and a Pasta Salad. Thank you for hosting! Lots of great treats linked up this week! I can't wait to start visiting! Hi Miz Helen, I'm sharing my Asparagus and Bacon Pasta Salad w/ Creamy Basil Pesto Dressing and my latest vegetable ferment - Savoy Cabbage, Carrot and Ginger. Thanks for hosting! I can seem to remember hearing the same story last summer Miz Helen. I swear, there's no pleasing us sometimes. We're having the coldest winter on record and I can't wait for the warm weather and you guys are absolutely sweltering over there. I really feel for you all. Thanks for hosting. I am so excited to see so many super Summer posts this week! i’ve linked up a raw kale salad stuffed zucchini recipe. also, it’s our second week for the Wednesday Fresh Foods Blog Hop – please feel free to stop by and link up your CSA collections, farmer’s market treasures, garden harvests, seasonal recipes, or related food politics rants :) Hope to see you there! and of course, thanks for hosting! 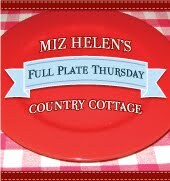 Another Full Plate Thursday and your plate sounds delicious. Thank you for hosting Miz Helen. I've linked up "How to make great crab cakes." Hope you have a wonderful weekend. Thanks for hosting Miz Helen! I hope you are having a great week and staying cool. I see a few links I need to go visit! Life has been rather hectic for me too. I'm slowing down this week. Glad to hear that you are too. Thank you for hosting! Have a blessed weekend! It's been a long time since I linked up to your Blog Hop! I'm off in the summer so I have more time to post recipes. I'm sharing my Italian Pasta Salad today. Hope you like it! Have a great weekend! Thank you for hosting an amazing party:) I love the way you filled your plate this week! Now I am off to check them out. Thank you so much for featuring my Apricot Chicken. I hope everyone enjoys! Today I shared two of my favourite Summertime recipes - A Marinated Tomato Salad that is just lovely with all the heirloom tomatoes that are ripening right now, and a Fresh Plum and Cherry Honey Crisp (nut-free, of course, for my daughter) which would be perfect out on your back proch! Have a wonderful day! Thanks for hosting Miz Helen! I just know your grandkids will love the Gorilla Bread I brought today! Wow! Thanks for featuring my Coconut Agua Fresca! Such a refreshing drink on a hot summer day. I linked up my Chocolate Raspberry cupcakes - a cheater recipe!! :) Have a blessed week! what a great recipe collection! thanks! I'm sharing some delicious Apricot Bars (GF, DF, Sugar Free), and The Secret To Cooking Perfect Quinoa - Every Time. Today I've linked up my iced tea float, it's black tea sorbet flavored with fresh mint and lemon floating in iced tea! A great way to keep cool in the summer. Thank you so much for hosting Miz Helen. Hope you're finding ways to keep cool. Summer has finally started here in Washington. I shared my favorite lentil salad with kalamata olives and fresh mint. Finn says Woof! I've linked my Almond Chicken this week. Super simple to make, this recipe elevates a few commonplace ingredients into a real treat. Enjoy! Good afternoon, Miz Helen! I've brought some bread to share! Thank you for hosting, have a lovely day! Miz Helen, thank you so much for featuring my asian noodle salad! I appreciate it!